Tickets went on sale today for Beau’s Oktoberfest 2012, and the first 1,000 passes sold come with a unique gift: a CD sampler of the bands who will perform at this year’s event. 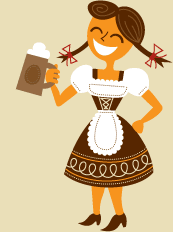 Oktoberfest is the signature fundraising event for Beau’s All Natural Brewery, and takes place Friday Sept. 28, Saturday Sept. 29, and Sunday Sept. 30 at the Fairgrounds in Vankleek Hill, Ont. Beau’s Oktoberfest is a three-day Bavarian-themed celebration of craft beer, local food and independent musicians. This year’s fundraising benefits local charities Operation Come Home, JustFood, and the Vankleek Hill Agricultural Society. To help further boost the Oktoberfest funds raised this year, Beau’s has enlisted local sponsors Desjardins Caisse Populaire Nouvel-Horizon, Harden Group, and Theoret Martel Proudfoot Insurance Brokers Ltd.
As in previous years, adult Oktoberfest revelers will be able to compete over the three days in fun challenges of strength and endurance, including the “Stein-Hold Struggle,” a spouse-carrying race, sausage eating contest, malt-sack races and beer keg toss. Families with children will find a variety of entertainment and activities for young ones in Kinderfest, a non-licensed area within the festival grounds. To complement the cuisine, Beau’s has promised 6 brand-new beers for this year’s festival, and will announce the beer names and styles during National Capital Beer Week in Ottawa (next week). For beer-nerds and those in-training, the Oktoberfest Beer School will host internationally acclaimed brewers, beer experts and aficionados, including Brewmaster Anders Kissmeyer (Denmark) who has been brewing collaboratively with Beau’s for nearly a year, and Brewing Historian Ron Pattison, (Netherlands) who is helping Beau’s recreate an historic ale for this year’s Oktoberfest. And Volo Cask Days returns featuring a variety of Real Ales from Ontario and Quebec. Single-day passes for Oktoberfest 2012 are $18 including GST, or one can save $9 on daily admission by purchasing a 3-day pass for $45. Round trip bus transportation from Ottawa can be added to any daily ticket for an additional $15. Each ticket also entitles bearers to a free parking, a souvenir alpine hat, pretzel, and first beverage (beer, coffee, pop or water). Note that drink tokens can be purchased in advance, a great way to avoid lineups on festival day. Tickets and more details are at www.beaus.ca. Saturday tickets have sold out the last 3 years and attendance is growing each year, so advance ticket purchase is recommended. Beau’s is currently looking for Oktoberfest “Volunbeers” who will get a free 3-day pass to the festival in exchange for helping out for one half-day shift. Volunbeers also get a Beau’s Volunbeer hat to keep, admission to the exclusive Volunbeers party, and free transportation from Ottawa if required, as well as the pretzel, drink token and alpine hat. Information about Volunbeering can be found at http://www.beaus.ca/volunteer.